Now, that's NOT BC as in Boston College but as in Bergen County (NJ)! Felon liar on probation, Bernie Kerik, is big in Jersey, folks. The article, written by sweet Jessica Humphrey-Cintineo reads like a Bernard Kerik Simon and Schuster press release. It is unashamedly unchallenged by basic follow-up and begs fact checking. 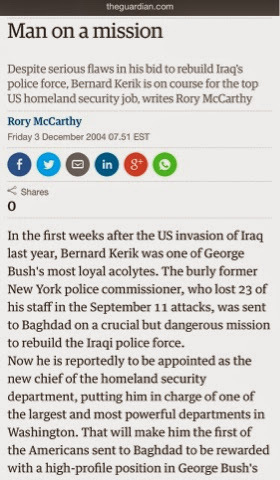 It is interesting to note, Rory McCarthy for "the Guardian" in December 2004, wrote a piece on Bernard Kerik in Iraq with the exact same title "Man On A Mission". Bernie is quoted in his usual narcissistic, psychopathic banter about his one, only and favorite subject; himself! “I’ve served this country in ways that are unparalleled, and it didn’t make any difference.”...“I worked for this country for 35 years,” said Kerik, 59. “I’ve done heroics on top of heroics." - Really, Bernie? Doesn't anyone else want to extol your virtues? I guess not. “No one in the history of this country with my background or success in police enforcement has been on the other side,” said Kerik. “No one has the perspective that I have right now in getting to see the system from the inside out.” - Do you all like that line because I wrote it! Bernie is using my work product, by evidence of this talking point quote, without my knowledge or compensation! Sweet Jessica goes on to write, "Kerik went from being an American hero to an inmate. Last year, inmate #84888-054 walked out of a Cumberland, Md. federal prison after serving three years and 11 days."... "His third book, “From Jailer to Jailed: My Journey from Correction and Police Commissioner to Inmate #84888-054” will be released in March 2015." - Among emails, phone calls, hand-written letters and regular visits, I had almost daily contact with inmate 8488-054 Bernard Kerik. Any "memoir" of his prison time is incomplete and lies by omission without reference to me and my contact/writing/editing/archiving. 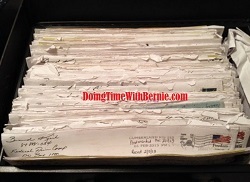 Again, Bernie Kerik has been advised not to use my writing from this time without permission or compensation. "He’s (Bernie Kerik) currently in the process of creating a national coalition to address criminal justice reform. "- Sorry Bernie: J.C. Watts, Jr. was chosen to head the new bipartisan Charles Colson Task Force on Federal Corrections. Bernard Kerik was quickly passed over for this recognized opportunity. 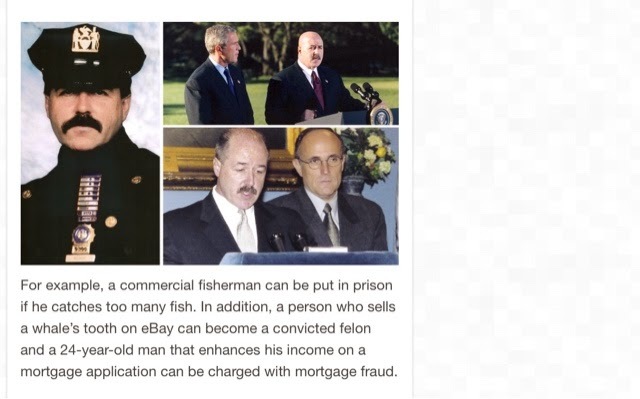 Has felon liar on probation Bernard Kerik turned Washington DC Insider Lobbyist? Most crooks begin and resurface in DC or Fox News anyway! Ha! The article is splattered with Kerik's self-serving old-school unauthorized flikr pics of Bernie with President Bush and Rudy Giuliani. Was this to give the IMPRESSION Bush and Giuliani in any way endorse Kerik these days? 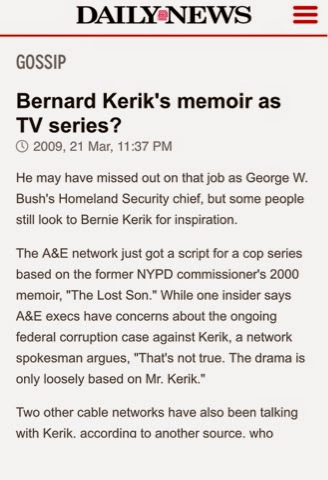 Anyone see a comment from President Bush on Bernard Kerik since Bernie's incarceration in 2010? Have you seen Rudy and Bernie share a stage or photo-op since 2009? NOPE! Did sweet Jessica follow up for this absolute puff piece? Of course not! "He travels to speak with both local and national groups, and students at college campuses. Recently, he spoke at the University of Vermont, the University of Massachusetts, and Penn State University—in one week.." - From prison, Bernie Kerik vowed to 'make up for everything he missed in prison'... - I suppose a college campus of young pretty things is a good place to start! "He is also working on a TV series"... - That old line again? Bernie has been "working" on this alleged tv series since before his indictment as referenced by thus New York Daily News article. "...and spends a great deal of time with his wife Hala and two daughters Celine, 14, and Angelina, 12." - What time is left after all Bernie's "fantasies"? Remember during sentencing when Bernie pleaded to Judge Robinson all he lived for was to drive his young daughters to school? What happened to that? Yup, liar felon on probation Bernie Kerik is a man on a mission. The question: Is this a mission of Bernie Kerik's self-destruction as his truth is slowly exposed? Stay Tuned.